There Are Eight Ways To Play First-Person Shooters. Apparently. Those who play shooters on a desktop already know that there is a considerable variety for how one can position him or herself. Let's say that there are supposedly eight basic ways, m'kay? This image originally debuted a while back in Japan, but is once again making the internet rounds. It shows eight (count 'em, eight) different styles to play first-person shooters. According to the above image, they apparently are: Standard (スタンダード), Arrow Key Style (矢印キースタイル), Inverted V Shape Style (ハの字スタイル), Russian Style (ロシアンスタイル), Crossed Legs Style (脚組スタイル), V Shape Style (Vの字スタイル), Glaring Style (ガン見スタイル), and Mongolian Style (モンゴリアンスタイル). To be honest, I'm not quite sure what's so Russian about "Russian Style" (do Russian players usually put the keyboard on their laps?) 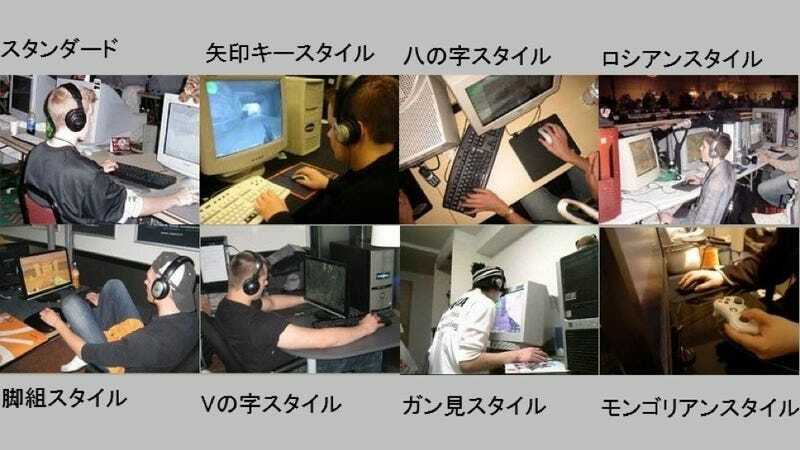 or why using a gamepad and a mouse is "Mongolian Style". The other styles seem to be self-explanatory, however. Which one best describes your play style?